You can reach the town e.g. down the road no 106 from Nowogard to Kamień Pomorski. In the town You must turn left into the road no 108 towards Parłówko and after a while turn left again towards Przybierów. The tower will be visible in the forest on the right side. 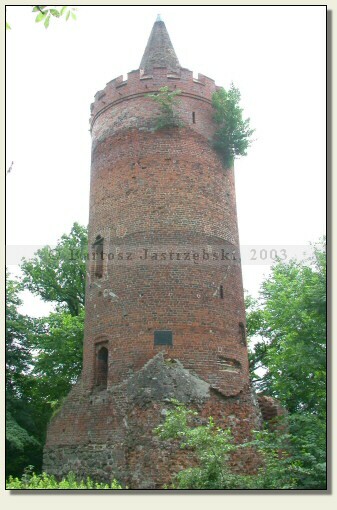 The Castel In Golczewo arose before 1304. 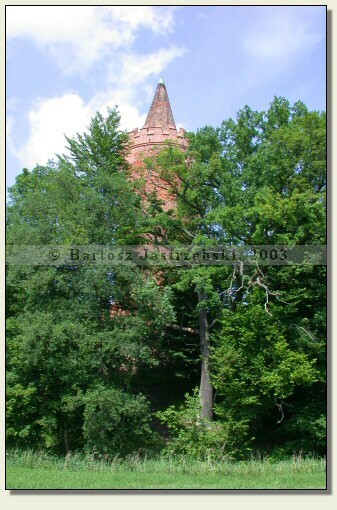 In that year the knights Ekhard and Wulfekin Smelling as well as Wedelstedt, whose name is unknown, passed the stronghold to the Church under an agreement with the bishop of Kamień Pomorski, Henryk Wachholz. Then begun the extension of the castle, which in the subsequent years was temporarily utilized by the chapter. Under the Flemming family’s rule the stronghold was sold in 1406 to the duke Boguslaw VIII. In 1436 the castle became the property of the chapter again, which utilized it almost continually until 1534, the year in which Golczewo became the ducal property.